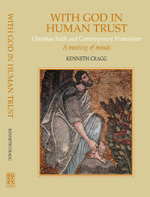 Kenneth Cragg was first in Jerusalem in 1939, and subsequently became deeply involved in areas of faith between Semitic religions under the stress of current politics. He later pursued doctoral studies in Oxford where he first graduated and became ‘Prizeman’in Theology and Moral Philosophy, and where he is now an Honorary Fellow of Jesus College. He was a Bishop in the Anglican Jurisdiction in Jerusalem and elsewhere in the Middle East, and played ecclesiastical roles in Africa and India. A Certain Sympathy of Scriptures is a companion book to his Readings in the Qur’an (1988; 1999), and more broadly to his Faiths in Their Pronouns: Websites of Identity (2002). Other works by Bishop Cragg, and published by Sussex Academic Press, include: The Weight in the Word –Prophethood, Biblical and Quranic; and The Education of Christian Faith.